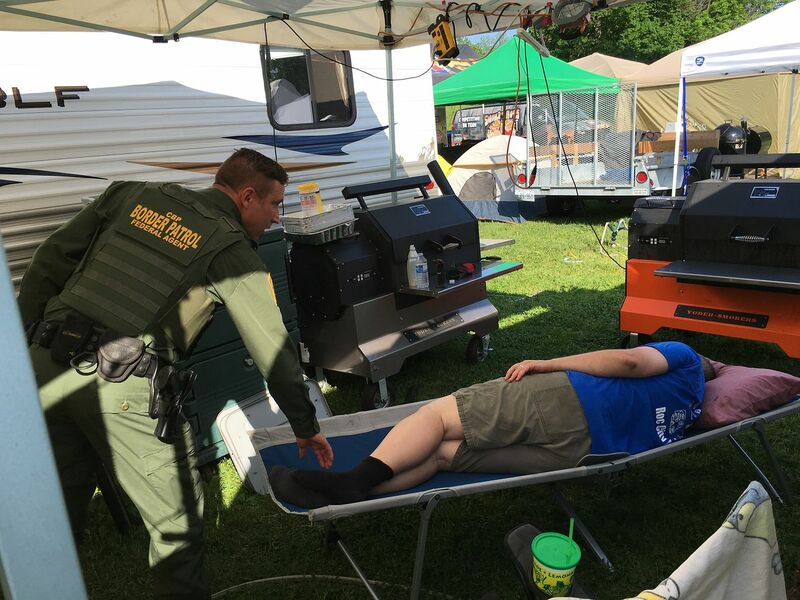 Last weekend, the Three Dogs BBQ roadshow packed up the trailer and headed to the 2016 version of the Roc City Rib Fest in Rochester, New York. This competition is one of our favorites for many reasons. But, I would say one of the biggest reasons is that this competition is sort of like the Super Bowl for New York BBQ. This test of a pit masters skills attracts top teams from all over New York, the Mid Atlantic, and Canada. Another wild card can be the weather. Three years ago Roc City was a complete mud fest with rain dominating the weekend. Last year was sunny, but it was so cold that dishwater was freezing in everyone's pans overnight. This year? Mother Nature dialed up an August weekend with temps in the shade running in the 90's and inside trailers at 100+. Sports drinks and bottled water kept everyone going during the hot muggy days. 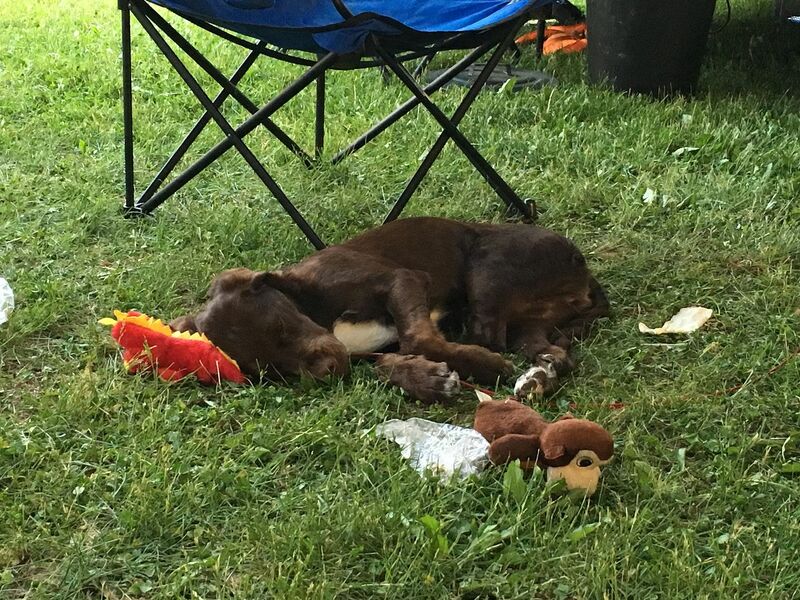 George was a trooper though, sleeping through the muggy days in the shade between his numerous drive-by pettings from passers by. 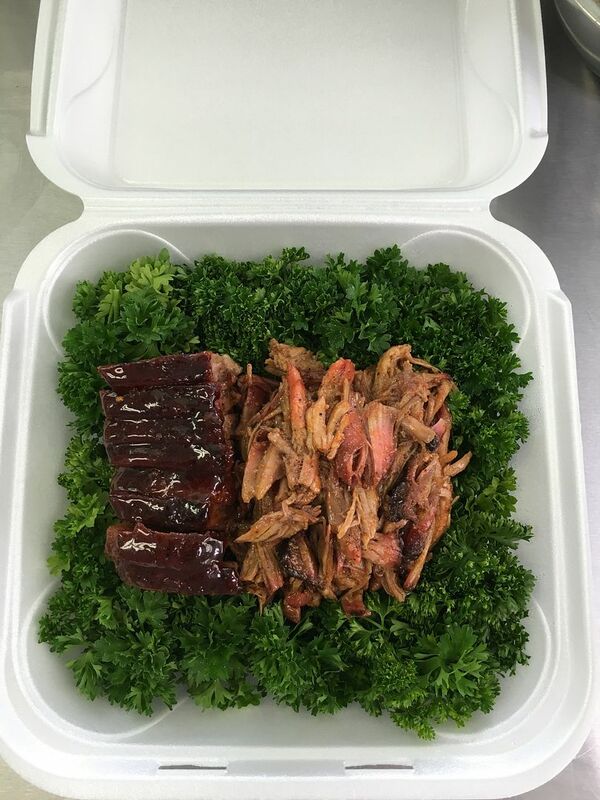 The KCBS competition was on Saturday night through Sunday afternoon, so the day on Saturday was spent catching up with friends, slowly prepping meats, building parsley boxes, and maybe pulling a prank or two on our unsuspecting Canadian friends. So, after a long night and morning of cooking, it was time to turn in the boxes. Here is the Lil General in action from Old Virginia Smoke. Kim runs the boxes as Luke is definitely not built for speed. Lets got to our boxes, shall we? The chicken box above came in 19th out of 50. This entry did win the "Table of Death" this table was labeled the TOD as all entries scored no higher than our 19th place, with most scoring in the 30's. 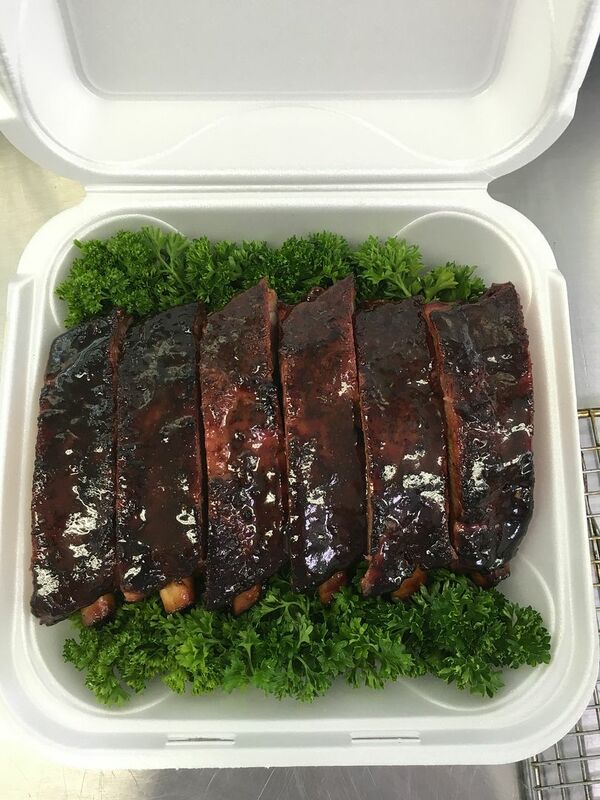 Our rib box came in 19th overall. This table consisted of scoring that was clumped between 19 and 30. For every TOD, there is also a Table of Angels. 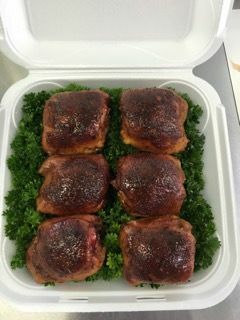 This pork box, while finishing third on the table came in eighth overall, with scores skewed toward the high end of the judging. 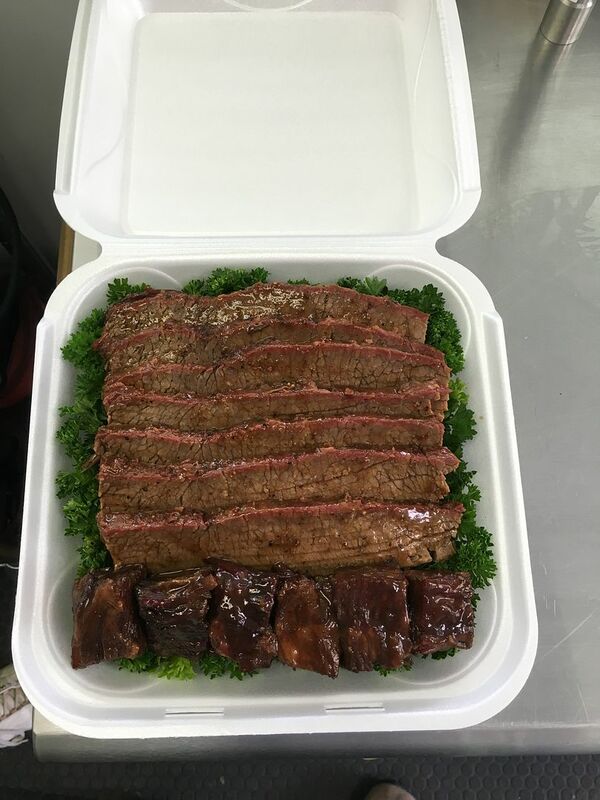 Finally, our brisket box. What used to be our worst category is turning out to be our most improved this year. This entry came in second overall, with scoring on the table being evenly distributed from top to bottom. All of the above added up to a fourth place finish overall out of fifty teams. To be honest with you, I was not expecting much after our cook. Mostly because we have never been able to manage a call in any of our previous four times at Roc City. Perhaps the hard work and practice is starting to pay off dividends. We shall see as the season progresses. 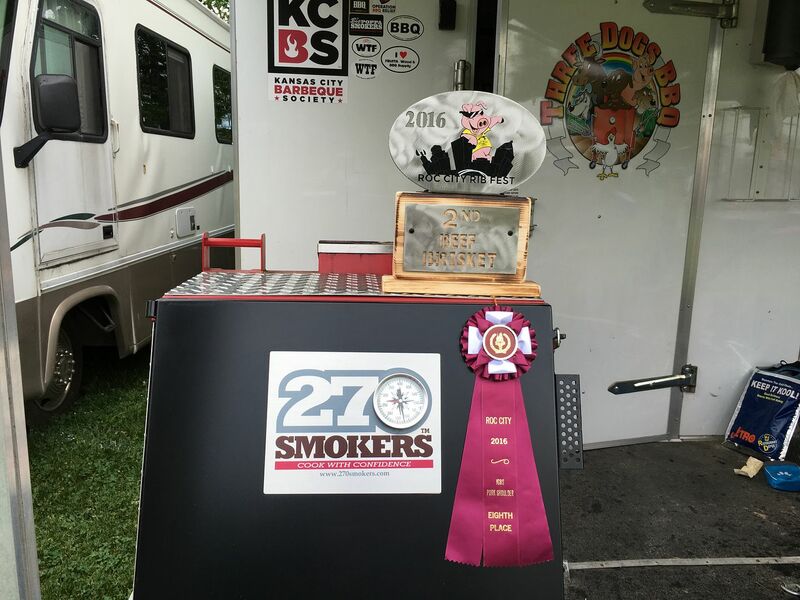 Congrats to our Grand Champion, Insane Swine, owners of one of the best logos in competition BBQ. Congrats also go out to Old Virginia Smoke, our Reserve Grand Champion. Finally, we would again like to thank Brian, Kelly, and their entire crew for making Roc City run smoothly. They always do a great job and this year was no exception. 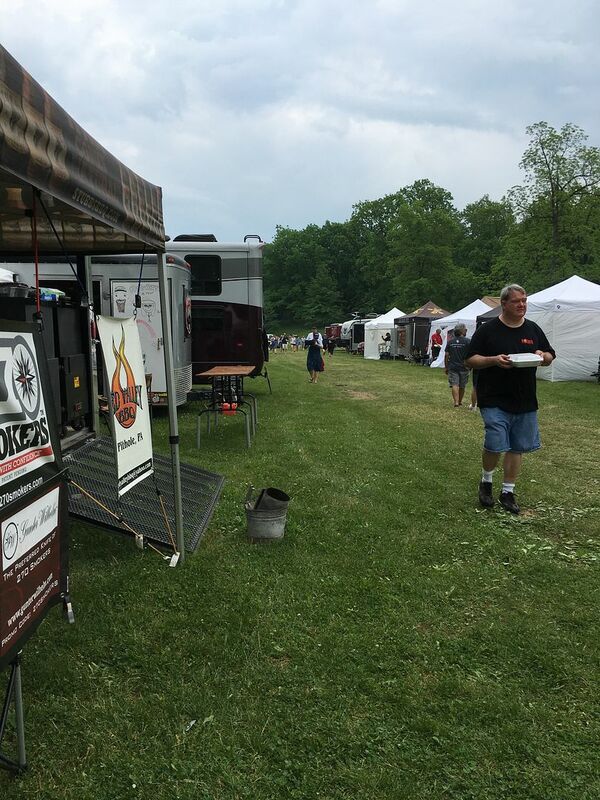 Next up for Three Dogs BBQ is the Covington Cork and Pork Festival, in Covington, VA. We hope to see you there.